Live Image Resize Script With PHP | Web and mobile development tutorials. There are many tools available for Editing image on windows or mac. Even free software available. In this Tutorial Let’s create online image editing tool for image resize. Let’s see how do i resize an image using simple PHP code. Take a look at the demo to know how the final code works. 1)First we will take inputs(Image,New Height, New Width) from user. 2)We will pass these data to the php script. 3)Then well use PHP multimedia fucntions like imagecreatetruecolor(), imagecreatefromjpeg(),imagecreatefrompng(), imagecreatefromgif(),imagecopyresampled(),imagejpeg() to create new image with new Width and new Height. 4)Finally we will display new Image to the user or we can provide a download link to download the image. For this application we will create both form and php code on a single page. //To disply newly created file. Right click save as to save your image. It’s so simple script. 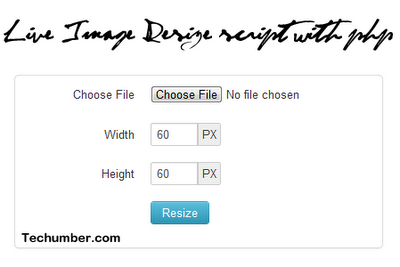 So this is how do i resize an image using PHP script. Hope you like it.